Admit it. At some (immature?) level, the tail end (ahem..) of the digestive process can be (uncomfortably?) funny. From the popular book Everyone Poops (“Birds do it, bees do it, kids with bended knees do it…” to fart jokes told by 8 year old boys and 80 year old men – this is a topic that gets laughed about. 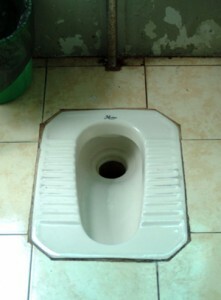 Typical squat toilet found in Asia (haven’t seen one in the Philippines yet). They are actually really comfortable! And while, “everyone poops,” there are very different rituals surrounding this (ahem..) regular process. The porcelain throne and toilet paper that reign supreme in the good old U.S.A. is not a worldwide combination (I was surprised to learn this as a youngster)! In Thailand, toilets are often porcelain platforms with a depression to squat over. In Japan, they sit but don’t need TP: a well-aimed hose and blow dryer take care of business. In India (and many other countries) touching people, passing food, offering to shake with your right hand is a huge offense. Why? Because toilet paper isn’t part of the culture here, and neither is the Japanese bidet. Maybe it’s just me, but I had a hard time wrapping my mind around other methods for the finale portion of… taking care of business. The bathroom is called the Comfort Room here in the Philippines. And in many comfort rooms, there is a scoop and bucket (often a 50 gallon drum) of water handy. (This is true in other S.E. Asian countries as well.) But what is it for? Occasionally, it’s clear that the scoop is for flushing. But even in Comfort Rooms where the flushing mechanism on the toilet still works, there is still a scoop. But why? Enter Lourdes. I knew this mystery would be tough to crack. While “everybody poops,” it’s pretty safe to say that nobody talks about it. My new friend Beth giggled uncomfortably as I plied her with questions. ”But why? But how? What about toilet paper? What about at home? 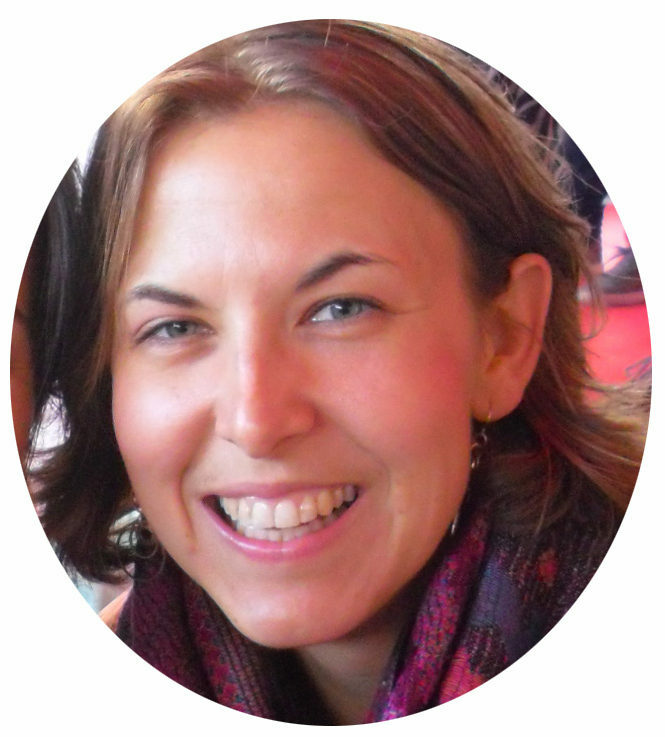 But how, exactly?” So out at a bar with my new friends, the toilet subject came up with Lou (Lourdes) – a friend of Beth’s who often travels to the states for months at a time. 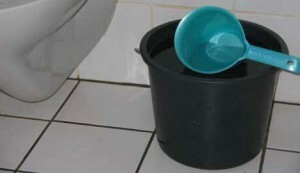 We commiserated regarding the adjustment period upon entering or returning to the developing country toilet situation. And then I asked her if she’d show me how to use the scoop. 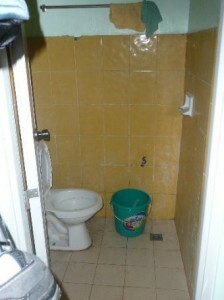 Standard Filipino bathroom – often with missing toilet seat. Even in your hotel room! And so ensued a hilarious ten minutes in the bathroom. In a nutshell, here’s what I’ve garnered from my lesson. The scoop is there because in Filipino culture, just wiping with toilet paper is DISGUSTING. Very, very unclean. Maybe this stems from the days when there was no toilet paper and the only way to wrap up your business was a wash? The scoop is for number two, mostly. At home, clothing on the lower half of the body is often removed to keep it from getting wet. The toilet is straddled like a horse, versus a chair sitting position. With one hand you work the scoop, dribbling water down your tail bone and down the front. The other hand is the scrubbing and splashing device. All this is followed up with a drying and thorough hand washing. And the whole process is considered far more clean than toilet paper only. More bathroom wisdom: How to Pee on a Bus! Dan, Hi! Good to hear from you! Sending you warm vibes – did you head back to the mid-west for Christmas? Pretty sure there are a solid handful of Dakota towns on the “U.S.’s 25 coldest places” list. Trip’s been awesome! Fantastic enough to get me thoroughly behind on posting. 🙂 Funny to hear from you right as my Sabang entry is ready to go to press. I checked out TBW – very nice! What sort of material are you looking for? I think I remember a few “more to come” endings on an article or two in the “Travel Checklist” section? For guest columns, I’m much better at meeting needs (“we want an article on _______”) than deciding what the world must want to know. Let me know, and enjoy the holiday vibe for me!